CBT (Cognitive Behavioural Therapy) A mind map made by an A* student about cognitive behavioural therapy. It explains how it works including the assumptions that need to be made for it work, common features of CBT and the main stages. There is also a page of evaluation with supporting evidence of it working, along with generic positives and negatives of using CBT as a treatment. Kety et al A mind map by an A* student explaining the study Kety et al. This study can be used if asked to give and example of an adoption study and is also evidence of the genetic explanation of schizophrenia. The mind map describes the study in detail by splitting it into aims, sample, procedure, results and conclusions. There is also a page of evaluation notes including points about reliability and validity. Comparison of ABA and CBT Notes from an A* student.A venn diagram showing the similarities and differences between the two types of autism therapies: ABA and CBT. Schizophrenia A mind map by an A* student outlining the features and symptoms of schizophrenia along with some general useful information about it. There are descriptions of both positive and negative symptoms and the main symptoms are circled. The bottom is slightly cut off, it is meant to say \"affective flattening reduced expression.....\"
Privation Notes by an A* student. A mind map explaining what privation is and three studies into privation: Genie, Freud and Dann, and the Czech twins. For each study, I have written about the weaknesses of the study and whether it suggests that privation can be reversed or not. There is also a page of evaluation points about general privation research including points about triangulation and ecological validity. Raine (1997) A mind map made by an A* student about the classical study for biological psychology. The whole study explained in terms of the aim, participants, procedure , results and conclusions. The study is condensed into key things you need to know with extra details to boost the marks. There is also a page of evaluation points including generalisability and validity. There are a balanced amount of positives and negatives given. Carlsson (2000) A mind map explaining the Carlsson review study into schizophrenia including results, conclusions and a brief description of what a review study is. There is also a page of evaluation points including reliability and objectivity. Key words in the evaluation are highlighted. Maternal Deprivation Hypothesis Notes by an A* student. A mind-map containing a summary of the hypothesis and a more in-depth description of both long-term and short-term effects of deprivation. This document also includes an evaluation of the hypothesis with supporting evidence, and some notes on how the effects of deprivation can be reversed (with supporting evidence). Reliability and Validity of Diagnosis A mind map made by an A* student. It gives the definition of reliability and validity and explains the different kinds. It also says what affects the reliability and validity of diagnosis. There is a page of evaluation which gives lots of studies relating to both reliability and validity and also some general evaluation points. Theory of Aggression - Brain Structure A mind map describing four areas of the brain linked to aggression. Evaluation included. Use of Interviews in Clinical Psychology Interviewing in clinical psychology. Definitions, evaluation, examples of 2 studies. 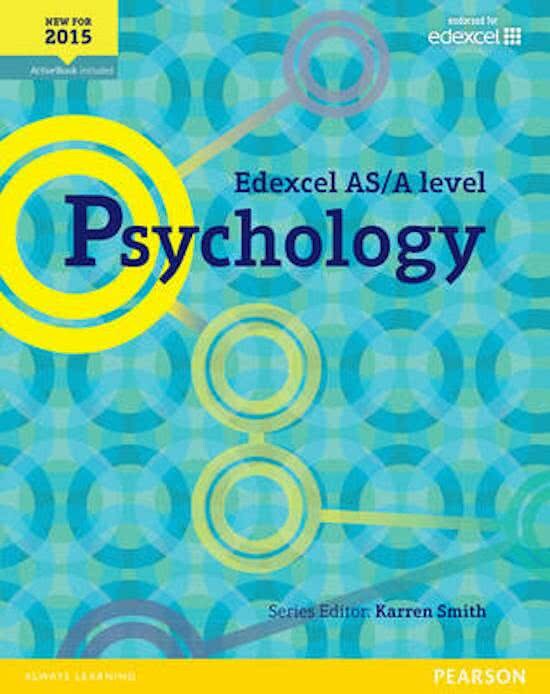 On this page you find summaries, notes, study guides and many more for the study book Edexcel AS/A Level Psychology, written by Susan Harty & James Bailey. The summaries are written by students themselves, which gives you the best possible insight into what is important to study about this book. Subjects like & Psychology will be dealt with.